Modi in Srinagar on 3 Feb 2019. The Prime Minister, Narendra Modi, has dedicated the 220 kV Srinagar-Alusteng-Drass-Kargil–Leh Transmission System to the Nation on 3 Feb 2019, saying it is a step that would ensure quality power supply to Ladakh round the year. Built at a height of around 3,000-4,000 meters, this approx. 335 km long transmission line has been constructed Power Grid Corporation of India Limited (POWERGRID) in 4.5 years. “We’ve left behind culture of delays,” said Modi off the Rs.2,666 crore project for which he had laid the foundation stone on 12 Aug 2014. 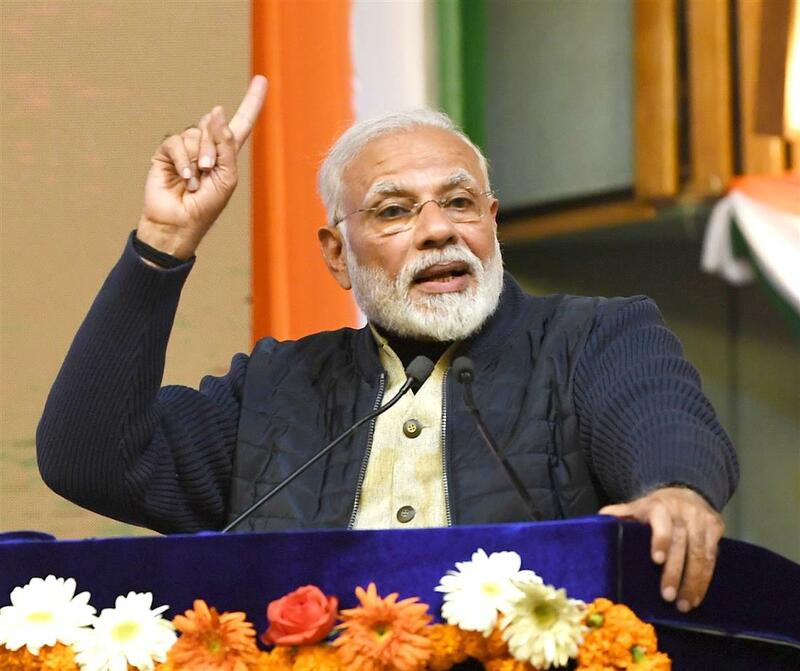 Completed by the Power Grid Corporation of India Limited (POWERGRID), a Navratna Company of Government of India, under Ministry of Power, the transmission system would boost the tourism sector and enhance socio-economic development of Ladakh, said Modi. In this project, the four new State-of-the-Art 220/66 kV Gas Insulated Sub-stations built at Drass, Kargil, Khaltsi and Leh will help to ensure 24×7 quality power in all weather conditions. Funding provisions have been in the ratio of 95% Government of India and 5% J&K state share). The implementation of this project was also aimed to supply power to the people of Ladakh in harsh winters and evacuation of surplus power of Kargil & Leh Hydel stations of NHPC in summers. This herculean task executed by POWERGRID in unforeseen weather conditions was made possible by immaculate project monitoring skills, high team spirit and strategic planning and use of modern technologies. The line remains snow covered for nearly six months with the minimum temperature going down to as low as -40 degrees at Drass. Therefore, specially designed tower foundations were constructed with assistance from Snow & Avalanche Study Establishment (SASE) for spotting the tower foundations, as the work force braved the challenge of working at lesser oxygen levels. It shall also provide grid connectivity and reliable quality power supply to the strategically important Ladakh region including defence establishments in the area.